Announcing this in Lagos, Mr. Ben Langat, the Managing Director, emphasised that the company attained five years plus 175 LTA-free days on World Environment Day, June 5, 2018. “We made this significant achievement through accountability and transparency in reporting incidents in addition to continuous learning and improvement, cross-functional collaboration, regulatory compliance and relentless commitment to safety”, Langat said. Speaking further, Langat asserted that FrieslandCampina WAMCO’s Safety, Health and Environment policy is designed to protect the work environment from pollution. “Building an injury-free workplace requires deliberate focus and investment. 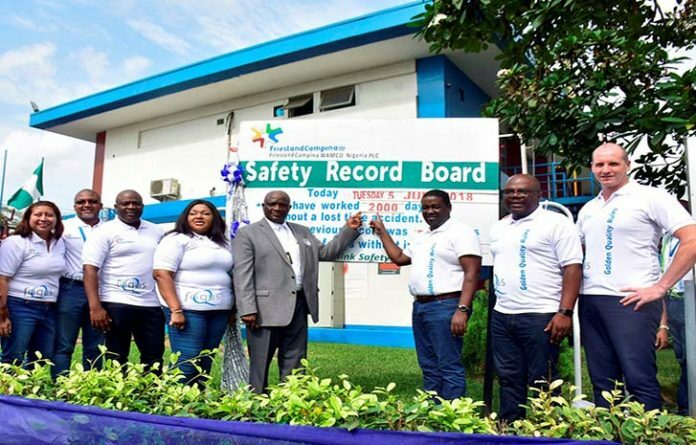 FrieslandCampina WAMCO devotes significant time and resources to implement safety controls and build an unrelenting safety culture. Consistently, we have invested in machine technology trainings related to trouble-shooting and maintenance. “At FrieslandCampina WAMCO Nigeria, safety is embedded in our culture, and employees are committed to going the extra mile to ensure a safe working environment which is incident free. “For this great result we thank all employees who have made this happen through their commendable safety behaviour. Together we will continue on our journey of leading with safety”, said Langat. Mr. Hakeem Dickson, the Director General, Lagos State Safety Commission, commended the company for its achievement, stating that the company has displayed exemplary safety conduct which has led to over five years of zero incidents. He encouraged others to follow this example. The World Environment Day was established by the United Nations General Assembly in 1972 and is celebrated every year on June 5 to raise global awareness on taking positive environmental action to protect nature and the planet Earth. This year’s celebration is themed “Beating plastic pollution” to address pressing environmental concerns.